Welcome welcome! Today is our monthly Stampin' Up! Facebook Project feature for the Artisan Design Team! I have forever been a monthly Facebook Artisan Design Team fan! I have always been (and still am) super excited when the project previews show up in my news feed from Stampin' Up!. I stop what I was doing and took in every fabulous detail of the designs. Heaven - right?! Can I admit that I am still a fan? Not of myself (well maybe a little), but if the team?? I just know that each month the projects are going to be finger licking good!! If you are joining us from the Stampin' Up! Facebook post I have great news for you!! We (the amazing design team), are here each and every Thursday with a blog hop! Yes - you do not need to wait a month! Set your smart phone alarms! 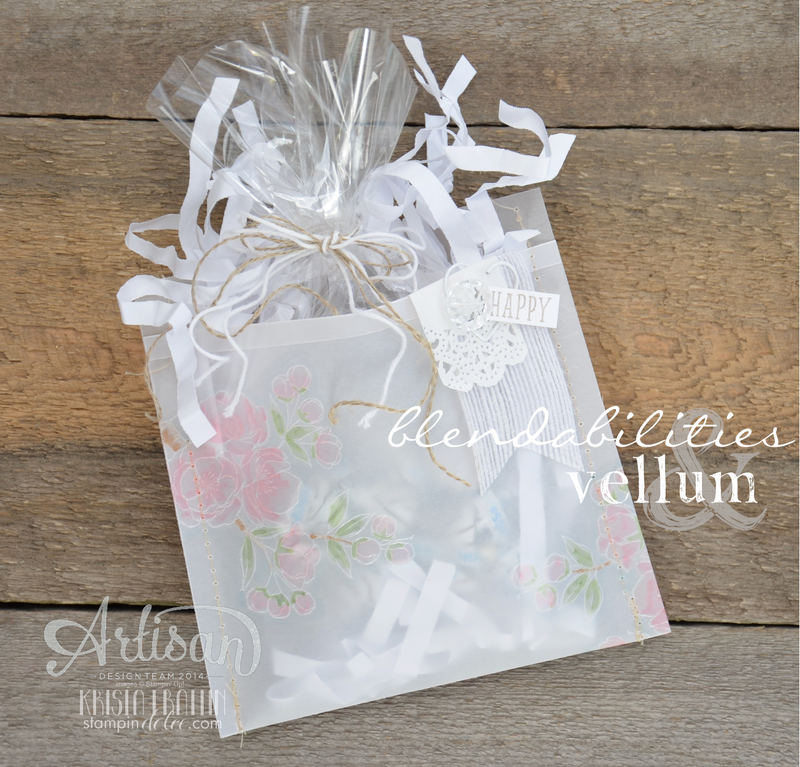 I created the treat bag with a piece of Vellum 5 1/2" x 11". Fold in half and trim 1" from one end. Score 1/4" from the end of the short side and fold back. I used my sewing machine to stitch up each side. The "HAPPY" is from the Indescribable Gift stamp set. Using Stampin' Blendabilities on Vellum is Fab-u-lous! I love love love the soft look! * Color inside the stamped lines with your Stampin' Blendabilities Markers. First, Coloring on Vellum is very forgiving! The ink does not dry as quickly as when working with Whisper White Cardstock. If you make an error or color out of the "lines", the Color Lifer Pen works wonders!! Second, Blendabilities will also color White Embossed Ink! I think this would lead to a number of great projects and ideas!! With this project you may want to steer clear of the lines and try to work within the image ... unless you want the lines to be colored. Now onto the rest of our amazing team! You MUST click through all 16 of us and see the designs! But first - Lisa Harlow ... Take it away!!! Thanks for visiting today! Have a creative day!! !